Elbows are mostly used for changing the direction in piping and are also sometimes called a quarter bend. With over a decade of experience in manufacturing Stainless Steel Fittings, our quality products and reliable services are guaranteed. Royal Industries is one of the leading exporter and supplier of nickel alloys & other specialty alloys for corrosion, heat resisting and other application past 10 years. 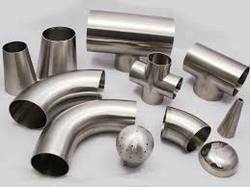 We are oneshop for nickel alloys for the requirement in pipes, plate, Aluminium, Sheets,Rods,wires, Gun metal nickel & other ferrous & Non ferrous metal in all shapes, fitting and flanges. supply material either from ex-stock or get it directly from the mill. What makes us unique from other supplier is our capability to supply material globally in stipulated timeframe. We serve industries like aerospace, power, energy, thermal, electrical, oil & gas, marine, etc.